Hmmmm . . . There are many people who would answer that question with a yes. But as I found out, that question is not easy to answer. The best way to approach this question is to break it down. So let’s start. First of all, what is a factory farm? There is no credible definition of a factory farm. What determines a factory farm? Is it size? Is it the type of housing used? Is it the technology used? Many who are critical of modern agriculture use the term “factory farm”. Even though there is no credible definition, most people would agree that a factory farm is the same as a CAFO (Concentrated Animal Feeding Operation). So from here on out, I will use the word CAFO. (Even as much as I dislike the way the word sounds). According to the USDA, 2500 hogs over the weight of 55 pounds is what defines a CAFO. Our hogs are housed in barns and are not housed outside on grass or pasture. And we have hogs for more than 45 days in the past 12 months. So that qualifies our farm as an AFO and a CAFO. This definition would describe our farm. Our farm consists of my husband and I. And as the definition states, the majority (97-98%) of farms in the U.S. are family farms. So when the question is asked, are family farms better than factory farms? It can’t be answered because we are both. We are both, as are many other farms. These terms are not exclusive. 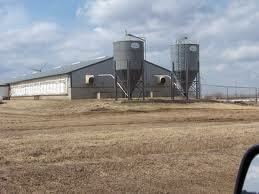 We definitely are a family farm and we also have a CAFO. According to FarmAid (an organization that helps family farmers), they also agree that family farms and factory farms are not exclusive, but their position is if farmers didn’t have the pressure to conform to “industrialized” (another way of saying factory farming) farming, they wouldn’t. Now maybe there are some farmers that agree with this statement, but I personally don’t know of any farmers that would. Does Farmaid really think that farmers should go back to the 1950’s nostalgic way of farming? And that we should ignore all the knowledge and technology that has been gained in the last 50-60 years? If we were to go back to that way of farming, half of our world’s population would starve. Instead of looking to the way of the past, we should celebrate the improved efficiencies and success of agriculture and look forward to keeping improving on efficiencies and animal well-being. Even though we know what works best for us, we completely respect other ways of farming. For us, we know bringing our animals inside has given us the ability to improve their care. Farming diversity is good for agriculture and good for consumers. When farmers can farm the way that works best for them, everyone wins.